Thanksgiving Decor Ideas to Celebrate the Season ~ From the front door to the table, you're sure to find something that will strike you fancy and please your guests. 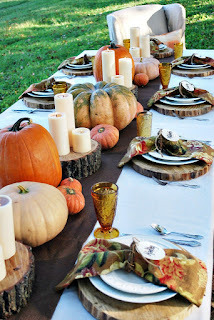 Outdoor Homage ~ This outdoor dinner table is outdoorsy perfection with strips of chocolate-brown burlap, groupings of pillar candles on wood chips, gourds of various sizes and colors that come together for a simple yet striking look that complements the table's natural setting. 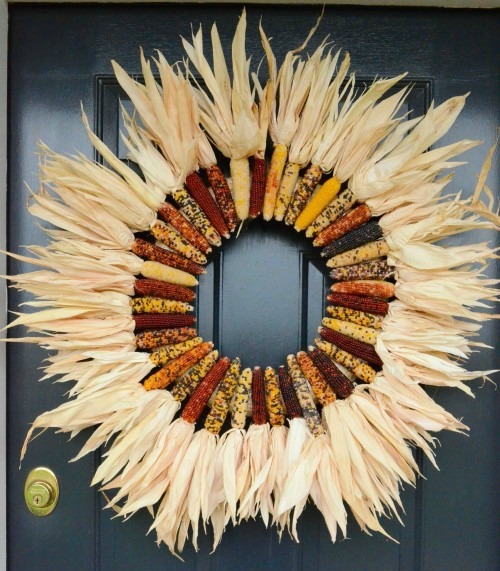 Colorful Corn ~ A staple element of Thanksgiving, bunches of vibrant corn easily come together to make a wreath. 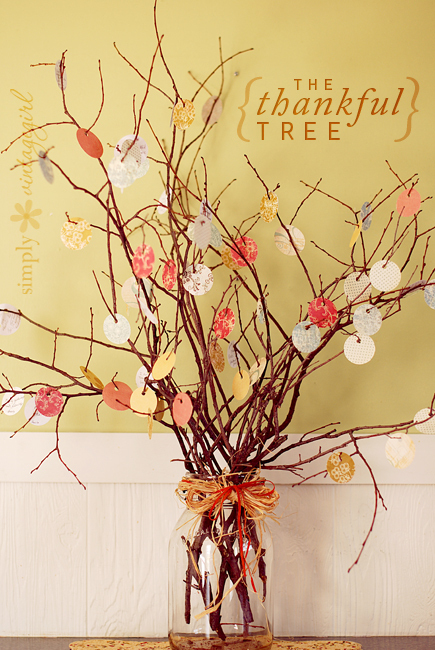 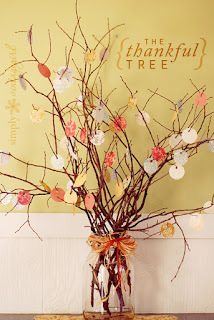 Thankful Tree ~ Twigs from your backyard create this thoughtful tree, which is adorned with hanging notes of gratitude. Door Tags ~ Not a fan of wreaths? 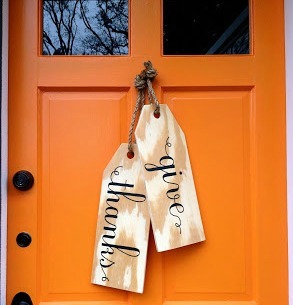 Hang wooden tags that you can easily DIY to prove just how grateful you are this season. 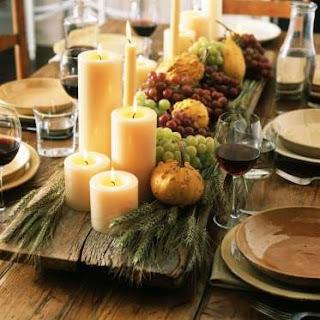 Rustic Elegance ~ Seasonal produce, sprigs of greenery, and white pillar candles of varying heights set off this rustic serving tray. Just remember to use unscented candles if they're going to be lit during dinner—aromatherapy can mess with your tastebuds! 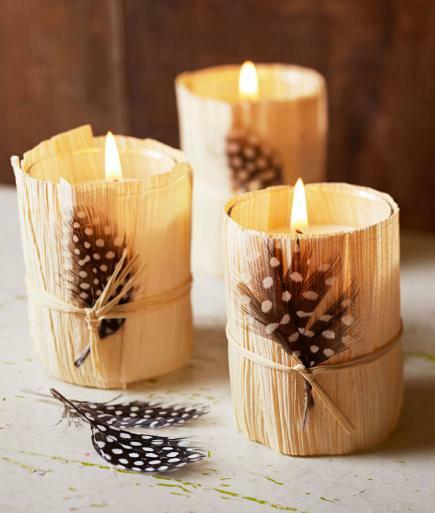 Cozy glow ~ Wrap glass votive holders in textural flair. Tie raffia around three or four overlapping moistened corn husks trimmed to fit. A spotted guinea fowl feather adds a flourish. 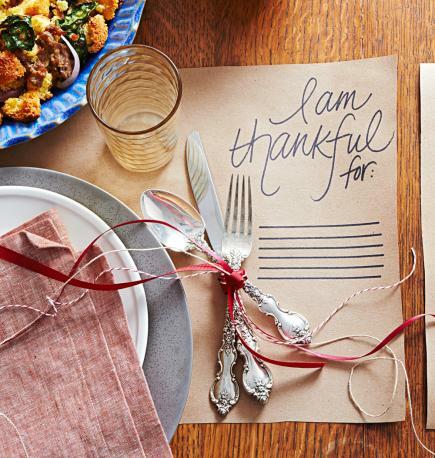 Give Thanks ~ For quick and easy homemade place settings, start with brown craft paper and create space for each guest to write a list of things they're thankful for. The lists will make great dinner conversation, too! 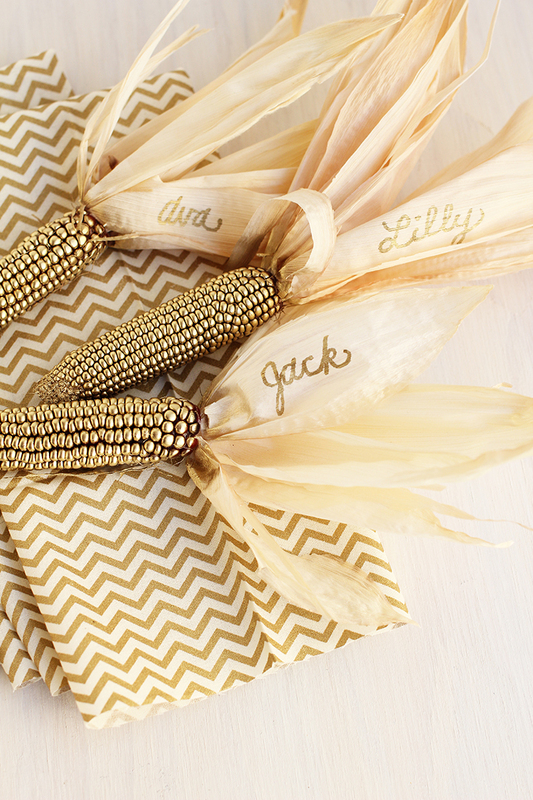 Golden Corn ~ Save a seat for your guests with a glamorous piece of shiny corn, complete with their name in neat cursive on the husk.